The National Museum of American History Library has recently acquired an interestingly shaped book—Sailors' Valentines, by John Fondas. 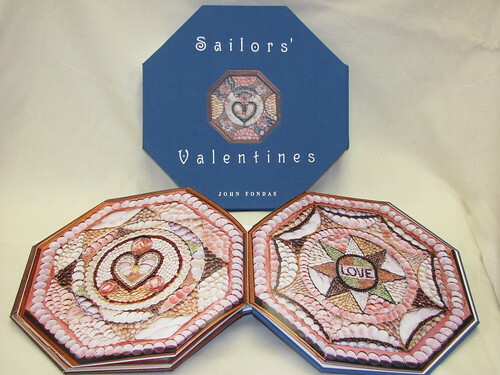 Sailors' Valentines were constructed out of eight-sided boxes and decorated with a wide variety of shells to create custom 3-D decorations. Mostly created between 1830 and 1880 in Barbados, these items became the sailor's choice of gift for those at home since Barbados was a popular port of call. The book, Sailors' Valentines, reflects the shape of its subject. Accompanied by fascinating research on the subject, photos of 49 specimens of Sailors' Valentines display the many designs and wide variety of shells used in these unique pieces of art. Viewing this beautiful book gives insight and appreciation into a small aspect of the past. Feeling inspired after viewing this book? We suggest you also see the On the Water exhibit and the Libraries' Paper Engineering exhibit, which are both conveniently located at the National Museum of American History.